Nicky Maynard was among three senior players who asked Dons manager Karl Robinson to play an U21s game against Stevenage today (Tuesday). Samir Carruthers and George B Williams also contacted the manager asking play in the game in order to keep match fitness up. 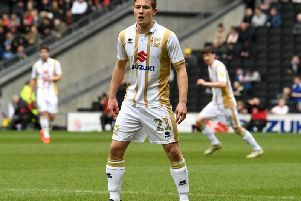 Maynard has been dropped for the last two games in favour of Kieran Agard having not found the back of the net at all this season, though Agard has also failed to score since his debut against Millwall on August 13. Robinson said he was impressed with Maynard's mentality since losing his place in the side. "Nicky Maynard is desperate to score goals," said Robinson. "Nicky has found it difficult in recent weeks. He cares so much about playing here. His family come to every game, and he has really tried to buy into the life here. He loves being here, but he feels he should be scoring. "I think if he'd been playing in the last couple of games, he would have had a few more chances and probably would have taken his goal. "He was frustrated to not to come on Saturday, but I get that. And then he asked to play in an U21s game. For these players to come to me with that mentality is fantastic."